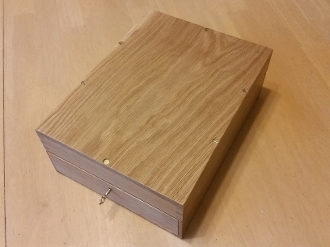 In response to the numerous inquiries asking if we could please sell the wooden box we use for our Open Enigma, we decided to make it available in a kit and in a assembled unit. This is the fully assembled box to encase your assembled Enigma Mark 4 kit. The box has been sanded and can be sprayed with multiple coats of acrylic lacquer and is pre-drilled to receive your top plate. Depending on availability, you can possibly order the box in Oak or Cherry. Enquire before you order to see what wood or boxes we have in stock and get a time estimate for shipping. Remember this is a natural wood product and may vary from the pictures above requiring more effort to finish as an assembled Enigma.